As I’d noted earlier, I hired a contractor to do the three parts of the build I didn’t want to handle; mainly the overall framing, electrical and HVAC work. Part one is the framing, and it’s now done. 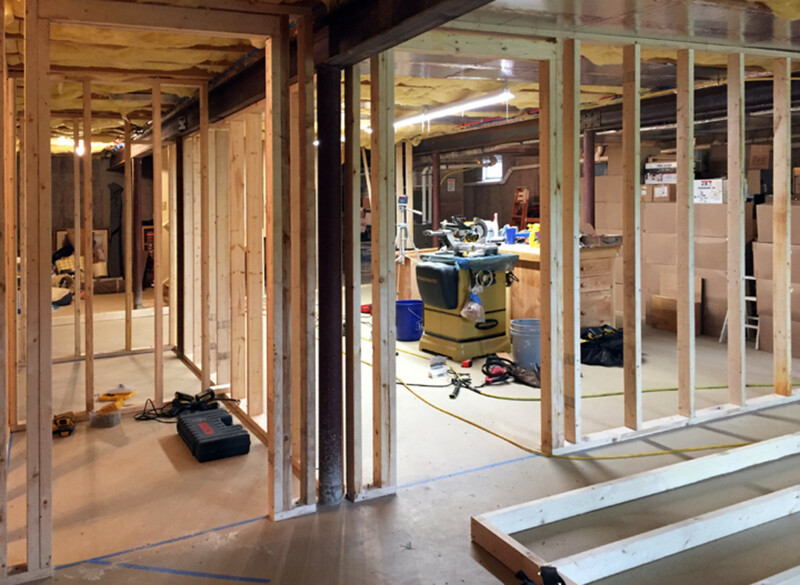 Here’s a view standing in the corner of what will be my office, looking out into the shop – shop door on right, closet on left. I’ve done a good bit of framing, but that was years ago, plus I’m older now and my knees just wouldn’t take all the up and down off the floor I’d have to do. More importantly, I’d be working alone, so although I probably could do all the framing myself, it’d take me forever. These guys were in and out in only a day and a half. That’s worth paying someone to do it. I could even have helped them, but then they would have charged me more. And while basic framing is something I’m both knowledgeable about and capable of – if slow – electricity is something I won’t touch. The electrician comes in later this morning to install a subpanel and start stringing wiring through the studs. After that it’s on to the HVAC – something else I’d rather not mess with. With those three things done it’s my turn to start all the drywall, finishing work, painting, ceiling, cabinets and the like. Still a lot of work to be done, but I can definitely see the goal getting much closer. I’m finally at the point of my shop build where I’m tackling the secondary stuff. That’s a Good Thing in general, but it also means I’m getting rid of stacks. Having the rare opportunity to build a new shop from the ground up gives you total freedom. Maybe too much.